Provide evidence of your qualifications and medical check-ups with the Pilz safety passport. In many companies a safety passport is a mandatory requirement for gaining access to production, for example, or to enable on-site services or engineering tasks to be performed. Many companies abide by the SCC (Safety Certificate Contractors) regulations. In accordance with this directive, use of a safety passport is mandatory. The Pilz safety passport contains personal and professional information such as address, employer, professional training, qualifications or medical check-ups. It serves as comprehensive evidence of qualifications, further training and the necessary medical examinations. 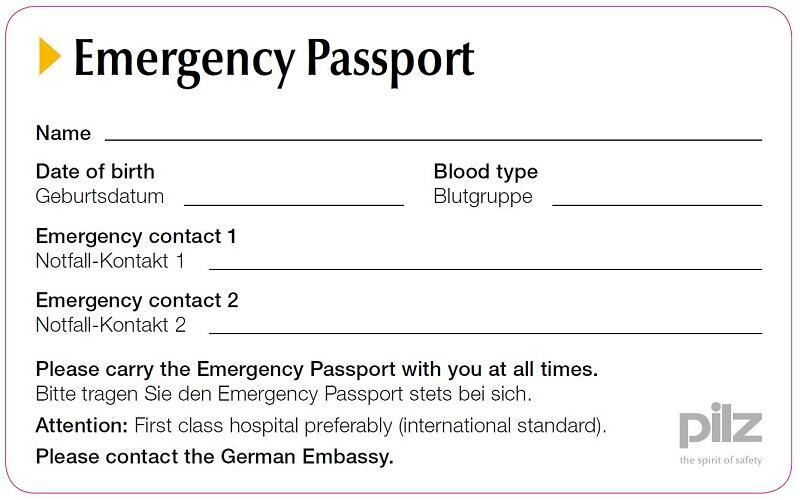 The passport contains a removable emergency ID, so that information on blood group, contacts etc. are quickly to hand if necessary. Each delegate on a Pilz CMSE - Certified Machinery Safety Expert - course receives this passport free of charge. Pilz enters all the information relating to qualifications. Delegates on all other Pilz training courses can also obtain the passport.